If you’d like to participate in a Diving Certification class while on vacation in Nassau or on Paradise Island in the Bahamas, our PADI-qualified Scuba Diving trainers provide diving students with a complete scuba curriculum. We offer dive courses for beginners as well as expert divers seeking to advance their education. Rookies can pick between the quick option of the Resort Course and the comprehensive training of the Open Water Certification Course. If you are already certified, you may continue your training on the Advanced Open Water program. 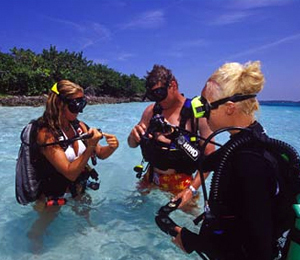 In addition, certified divers can also take advanced specialty Scuba Diving courses. Our educational professionals will make sure that you are given the total benefit of their vast Scuba Diving knowledge. A Resort Scuba Diving Course, also known as a Discover Scuba program, is a one-day training session that gives uncertified divers a chance to dive in the open water under the direction of a professional instructor. Participants start the day with a brief classroom meeting before jumping in the pool to become habituated with the scuba equipment and the breathing apparatus. After the confined water session in the swimming pool, you will venture off-shore in one of our customized dive crafts for an afternoon of scuba in the transparent waters of the Bahamas under the watchful eye of our PADI-qualified divemasters. You won’t find a better vacation paradise to achieve your Open Water Certification than in the gorgeous environs of the Bahamas. The PADI Open Water Scuba Diver Certification course will not only prime you to scuba dive in the Bahamian waters, but anywhere else on the globe. This PADI-endorsed class has three important steps: the knowledge development step, the confined water step and the open water step. The knowledge development step includes online, classroom, or at-home study and testing. The confined water step provides participants with the chance to absorb the requisite scuba skills and become familiarized with the gear while maneuvering underwater. Participants have the opportunity to use their new aptitude off-shore in the open water while on an expedition in the cerulean waters of the Bahamas. If you’ve allowed your Scuba Diving skills to deteriorate, a Scuba Diving Refresher Program is a great way to restore those forgotten skills and remember the proper safety procedures. This Refresher Course was created specifically to ensure that lapsed divers return to the Open Water with a renewed confidence and awareness of the undersea environment. The Refresher Program consists of a short in-class review, confined water practice in a swimming pool, and finally an Open Water Dive session off the coast of Nassau. There isn’t a more splendid location to revive your enthusiasm for Scuba Diving than in the tropical waters of the Bahamas. Also referred to as the Open Water Checkout Program, the Open Water Referral Course lets divers-in-training to start their certification training at their local dive shop. Once the initial classroom study and pool work is finished, participants can bring their referral paperwork to the Bahamas, where they complete the certification process on an Open Water dive trip with one of our PADI-endorsed dive instructors. There’s no need to spend any of your vacation in a classroom studying, or splashing around a pool in scuba gear. On the Open Water Referral Program, you can begin your initial offshore dive right away. If you are already certified and would like to broaden your diving knowledge, the Advanced Open Water Certification Program is the next step in the PADI curriculum. Although this may seem like just another class, it’s actually more like an exciting five-part Scuba Diving adventure. The first two portions of the Advanced Open Water Certification Program include an Underwater Navigation Dive and a Deeper Water Dive. Participants then have their choice of a variety of specialty options for three more expeditions. Some of the options include: Night Diving, Underwater Videography, Digital Underwater Photography, Wreck Diving, Drift Diving, Fish Identification, Underwater Nature Study, Multi-level Diving, Search and Recovery, Underwater Scooter, and Dry Suit Diving. If you would like to attempt additional Scuba Diving challenges once you have finished your Advanced Open Water Certification, we have the courses for you. Our dive instructors offer even more certifications including Divemaster, Rescue Diver, as well as Specialty Certifications like Underwater Videography, Night Diving, Digital Underwater Photography, Dry Suit Diving, Wreck Diving, Fish Identification, Underwater Nature Study, Drift Diving, Multi-level Diving, Underwater Scooter, and Search and Recovery. Our Nassau Scuba Diving professionals are available to answer any of your questions by phone about the available Scuba Diving Certification courses.